Isla Iguana: a fishing paradise in Panama. Isla Iguana is located 320 kilometers south east of Panama city, in the district of Pedasi, in the province of Los Santos. 7 kilometers from the coast. Isla Iguana is home of 16 hectares of spectacular coral reef. It has 11 species of corals, spanning more than 4,800 years in age and it is home of more than 542 species of fish. The island is also the home of more than 2,000 frigate birds. Isla iguana is home of the whitest beach in the country of Panama, with crystal clear waters that are easy to swim in for the youngest of age. Isla Iguana: Panama´s secret fishing and protected island. Isla iguana was declared a national park in 1980, and was declared an official protected ecological and tourist destination. It is also protected by the CIPA association which protects birds on the island. The protection of this island has had a positive and significant socioeconomic among local fishermen that have depended on the islands marine resources for many years. There are giant schools of red snapper (lutjanus sp), Grouper (epinephelus panamensis) and several other species, including wahoo, dorado, yellowfin tuna, sailfish and roosterfish. Isla Iguana: Why the island is a fishermans paradise in panama. The Humboldt current is a primary reason for large currents bringing sealife to the shores of Isla Iguana, these currents sweep for long distances and by the continental shelf that lays less than a mile from Pedasi in the Azuero Peninsula. During the rainy season, the rivers flowing into the oceans fertilize the phytoplankton and contribute to the marine food chain in the waters of the Azuero Penninsula. Isla Iguana: How do I get to Pedasi ? Isla iguana is a fisherman´s paradise and only 20 minutes from shore on a 40 horsepower engine. 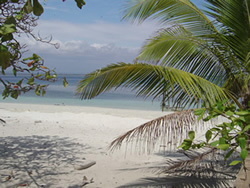 To get to Pedasi, it is a scenic four-hour drive from Panama city to the small town of Pedasi. Pedasi Fishing offers free transportation from the airport to the hotels in Pedasi.If you are looking for an off the beaten path vacation consider fishing in panama.Fishing in Panama´s tuna coast.